“Horseshoe chairs” are of the most handsome and classical chair designs. 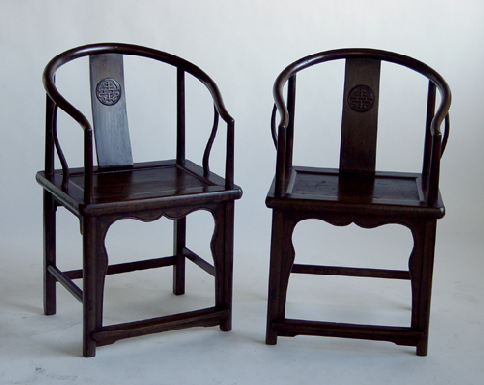 Of continuous arm with front post construction, modest stature, simple bead relief carving on front apron, united four feet by base stretcher, and traditional Shanxi style, the back rails and arms of these chairs form a continuous semicircle that gently descend toward the front. Walnut being of higher quality wood, is an indication of higher craftsmanship. The back splat is a single panel with the “shou” character symbolizing longevity. Graphic sources reveal these chairs were used ceremonially and reserved for persons of high rank and social importance. When seated in this pair of chairs, one is warmly greeted by a gentle, fond embrace.